Jimmy has made a commitment to the San Antonio area by establishing the South Texas Professional Scouts Showcase, Junior/Senior All-Star Game, Brian Wilson Memorial Golf Tournament, Nationals youth scout league, and continues to help players in the San Antonio area reach their baseball goals. THE TOP RECRUITING EVENT IN THE SOUTH. OPEN TO ALL HIGH SCHOOL PLAYERS. THIS EVENT HAS HAD OVER 200 PLAYERS GO ON TO PLAY COLLEGE BASEBALL AND MANY PLAYERS THAT HAVE BEEN DRAFTED AND SIGNED BY MAJOR LEAGUE BASEBALL. 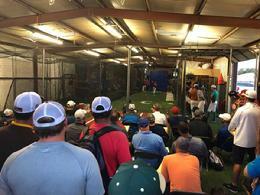 THE CAMP IS RUN EXCLUSIVELY BY PROFESSIONAL SCOUTS TO HELP AREA PLAYERS GAIN EXPOSURE TO COLLEGE AND PRO SCOUTS. SCOUTS FROM MULTIPLE PRO TEAMS AND A LARGE NUMBER OF COLLEGE COACHES WILL ATTEND. (WE USUALLY AVERAGE BETWEEN 50-75 SCOUTS AND COACHES). ALL OF THE SCOUTS AND COACHES THAT ATTEND ARE LOOKING FOR PLAYERS, THEY ARE NOT PAID TO ATTEND LIKE OTHER CAMPS AND SHOWCASES. REGISTRATION: YOU CAN REGISTER BELOW BY CLICKING ON THE PAYPAL BUTTON, LIST THE PLAYERS NAME, SCHOOL, GRADUATION YEAR AND POSITION IN THE COMMENTS COLUMN, YOU WILL BE SENT A CONFIRMATION TO THE EMAIL THAT YOU USE WITH YOUR PAYPAL ACCOUNT. REGISTERING BY MAIL: SEND A CHECK TO: JIMMY GONZALES, 16022 WATERING PT, SAN ANTONIO , TX 78247 (ALSO INCLUDE A NOTE WITH PLAYERS NAME, SCHOOL, GRADUATION YEAR, AND EMAIL ADDRESS. LIVE BATTING PRACTICE, DRILLS, AND PLENTY OF SWINGS. THE ORIGINAL HITING NIGHT IN SAN ANTONIO. WORK WITH PROFESSIONAL INSTRUCTORS AND SPECIAL GUESTS EVERY TUESDAY NIGHT FROM 7-8:30. HIT LIVE BP, DONT WASTE YOUR TIME HITTING OFF MACHINES!! STANDING ROOM ONLY FOR SCOUTS AT THIS YEARS SHOWCASE WITH OVER 75 PROFESSIONAL SCOUTS AND COLLEGE COACHES IN THIS YEARS 2 DAY EVENT. EVERY NOVEMBER 13, YEARS RUNNING, THE ABSOLUTE BEST RECRUITING SHOWCASE ANYWHERE!!! THE 10TH ANNUAL GAME WILL BE PLAYED JUNE 22 AT ST. MARYS UNIVERSITY (7PM), THIS GAME FEATURES THE TOP AREA SENIORS VS UNDERCLASS. THIS GAME IS COACHED BY MULTIPLE PROFESSIONAL SCOUTS AND ATTENDED BY A NUMBER OF PROFESSIONAL SCOUTS AND UNIVERSITYS FROM AROUND THE STATE. MAJOR DIV 1, DIV 2, DIV 3, NAIA, AND JUNIOR COLLEGES WILL BE THERE. OFFERING PLAYING OPPORTUNITY'S FOR AGES 9U-18U. LIMITED NUMBER OF PLAYERS, TOP TOURNAMENTS, PROFESSIONAL INSTRUCTION, OUR OWN PRIVATE TRAINING FACILITY. 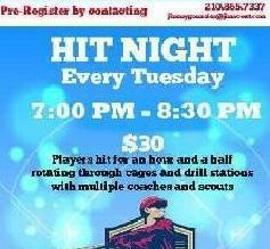 CONTACT: 210-616-2258 FOR MORE INFO., OR ATTEND TUESDAY HITTING NIGHTS AT 7PM. OPEN TO PLAYERS OF ALL AGES, LIMITED TO THE FIRST 50. 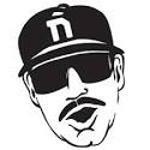 DOMINGO AYALA RETURNS TO THE JIMMY GONZALES BASEBALL ACADEMY, OPEN TO THE FIRST 50 PLAYERS. 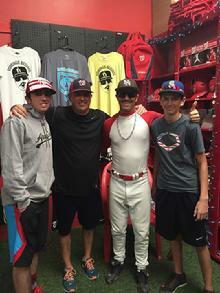 BIG THANKS TO DOMINGO AYALA FOR A GREAT DAY AT THE JIMMY GONZALES BASEBALL ACADEMY!! 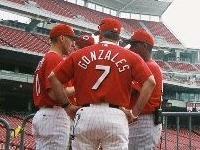 Jimmy Gonzales will manage the Washington Nationals Area Code team in Long Beach , Ca. on August 4-09. The team will consist of the top high school players from Virginia,North Carolina, South Carolina, Florida, Georgia, Tennessee, Alabama, Mississippi, and the DC area. This is the tenth year that he has managed or coached in the Area Code Games. The Top High School spring event in the area!!!! 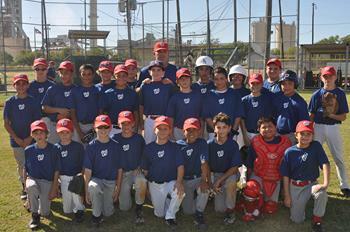 THE FIRST ANNUAL SAN ANTONIO FUTURES GAME WAS PLAYED ON NOVEMBER 9, 2014. 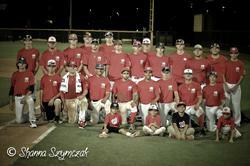 THE TOP 24 PLAYERS FROM THE SAN ANTONIO AREA (14U) PLAYED A SEVEN INNING GAME AT MADISON HS. IN ATTENDANCE WERE PROFESSIONAL SCOUTS, COLLEGE COACHES, CURRENT AND FORMER PROFESSIONAL PLAYERS, FAMILY AND FRIENDS. 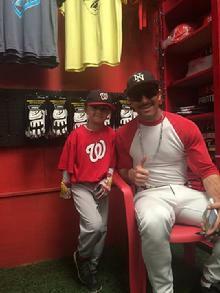 WASHINGTON NATIONALS SCOUT JIMMY GONZALES WITH NATIONALS ROOKIE BRYCE HARPER. 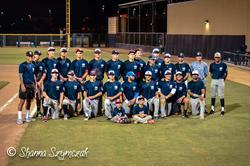 2014 SAN ANTONIO HIGH SCHOOL ALL STAR GAME TRYOUT! TRYOUTS FOR THE 2014 SAN ANTONIO HIGH SCHOOL ALL STAR GAME WILL BE MAY 25, 10AM AT MADISON HIGH SCHOOL. THIS IS THE EIGHTH YEAR OF THE GAME THAT IS COACHED BY THE PROFESSIONAL SCOUTS OF TEXAS AND HAS OVER 50 COLLEGE COACHES ATTEND. THE ALUMNI LIST FOR THIS GAME INCLUDES A NUMBER OF CURRENT PROFESSIONAL PLAYERS AND COLLEGE PLAYERS. EACH YEAR THIS GAME AVERAGES NEARLY 1500 FANS. THE TRYOUT IS FREE FOR ALL AREA HIGH SCHOOL PLAYERS, TEAMS WILL BE SELECTED THE FOLLOWING WEEK. PLAYERS STILL PARTICIPATING IN THE PLAYOFFS CAN NOT ATTEND. THERE IS NO REGISTRATION TO TRYOUT, JUST SHOW UP. The 8TH annual high school all-star game will be played in front of over 50 college coaches and professional scouts. The first recruiting event of the summer for San Antonio area players. Former players include professional Tyler Ogle (Dodgers), Nick Lee (Nationals), Jacoby Almaraz (Cardinals), Tyler Gonzales (Bluejays), Casey Selsor (Nationals), Cory Bafidis (Nationals), and many current and former college players. The game also averages a crowd of around 1500 in its 8 year existence. Tickets are available at the game for $5. Kids are free. Schedule for game Day: 7pm Game Time, batting practice strats at 4:30pm. 8TH ANNUAL GAME THAT SHOWCASES THE BEST PLAYERS IN THE SAN ANTONIO AREA. THIS GAME IS RUN BY THE PROFESSIONAL SCOUTS IN SOUTH TEXAS, WHO ALSO COACH THE TEAMS. OVER 50 PROFESSIONAL SCOUTS AND COLLEGE COACHES ATTEND THIS GAME. SOME OF LAST YEARS COLLEGE ATTENDEES INCLUDED THE UNIVERISTY OF TEXAS, OKLAHOMA U., TEXAS TECH, BAYLOR, AND MANY OTHER COACHES FROM ALL DIFFERENT LEVELS. WE EXPECT A BIGGER COLLEGE GROUP THIS YEAR. 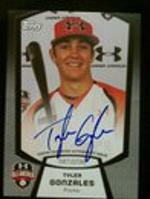 3x South TX Scouts Showcase Participant. Jimmy Gonzales with 2007 Hall Of Fame Inductee Cal Ripken JR. at the Professional Baseball Scouts Banquet in Beverly Hills, California. Oct 30- It's becomming quite evident that the South Texas Professional Scouts Showcase is the place to be for hopefull college and professional players. The showcase saturday completed the 4th annual event. What makes this showcase work is that it is run by professional scouts, the large number of college coaches, and the minimal (75.00 donation) price. Over 200 players participated in this years event at St.Mary's University. The professional scout and college coaches turnout was like it always is, excellent. From phone calls and emails that have been received the past few days it is obvious that players are being contacted and offered scholorships that attended this event. This event is for the players, run by the scouts. We only wish we had more room to accomadate the number of players that want to participate. So look for 2011 information on the site, and don't miss this opportunity next year!! San Antonio, Tx 12:00 Shotgun start, Dinner, and incredible memrobilia auction. The Brian Wilson Memorial Scholarship Tournament was another huge success. Former and current professional players, family members, scouts, coaches, and friends of the baseball community were in attendance. All the money raised through the tournament and auction go to the Brian Wilson Memorial Scholarship fund. Check for details on next year's event. UTSA HEAD COACH SHERMAN CORBETT AND WASHINGTON NATIONALS MIDWEST SUPERVISOR JIMMY GONZALES SPOKE AT THE 2009 SAN ANTONIO JUNIOR SENIOR ALL STAR BANQUET. 3rd Annual Brian Wilson Memorial Golf Tournament a Huge Success!!! The third annual Brian Wilson Memorial Golf Tournament took place November 10th at the Quarry Golf Club in San Antonio Texas. This years tournament played at the Quarry Golf Club in San Antonio had over 120 players including scouts, college coaches, and professsional players including Cincinnati Reds rookie Jay Bruce. All the funds benefit the Wilson Family. Brian, a co worker and best friend of Jimmy Gonzales passed away in 2006 due to a massive heart attack at the young age of 33. He left behind a wife and three young daughters. For more info. on playing or sponsoring this event next year, contact Jimmy Gonzales @ www.jimmygonzales@jimscout.com 0r 210-865-7337. 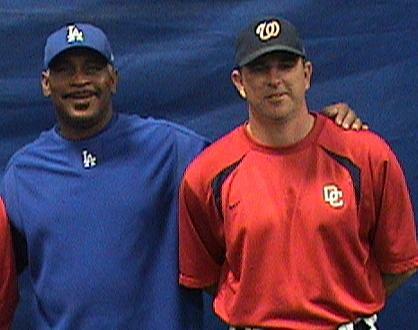 Mike Easler was named Major League Hitting Instructor yesterday for the Los Angeles Dodgers. He will assist new Dodgers Manager Joe Torre for the 2008 season. Mike is well known in the San Antonio area, doing several clinics including this years Mike Easler Christmas camp. Congratulations to Mike! !